What makes a product development company successful? Find out how to look inside your company for product development success. It all comes down to technology tools, talent and eliminating process inefficiencies. How are successful product development companies differentiated from their competitors? Manufacturers of all sizes are under constant pressure to get products to market faster and improve profit margins to stay ahead of the competition. The best performing product development companies put out low cost, high quality products in the intended timeframe. This helps them deliver on 87% of revenue targets and increase profit margins by 15%. Top performing companies realize success can come from within including a focus on process efficiency improvements are credited as having the most profound impact on revenues and margins by twice as many best-in-class companies. Every company out there is looking for an advantage but how do they do it? 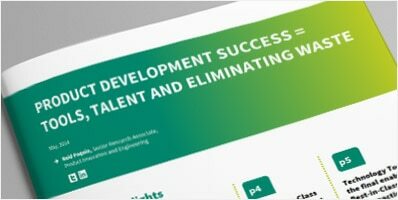 A study conducted by the Aberdeen Group revealed that the best-in-class companies in product design and development have identified engineering talent and technology tools as the enablers of their success.